The diversity of handicrafts in Iran is so high that preparing a list of them can take too long; however, it is a well-known fact that Iranian handmade carpets always sit atop the list. Handmade carpets have a special value among Iranians. In every single part of Iran, from Tabriz and Qom to Mashhad and Fars, and even among nomads, Iranian families weave carpets. Every carpet mirrors a matchless pattern and a unique combination of hues blending into each other, which is different from one city to another. You will not discern the difference unless you happen to see the juxtaposition of two rugs from two cities. Just like other handcrafts in Iran, one can smell the fragrant scent of women’s hands intertwined with the knots of the hanging rugs. Women have always been in the vanguard of handicrafts. Iran’s south-western province of Fars is one of the pioneering regions in carpet weaving. 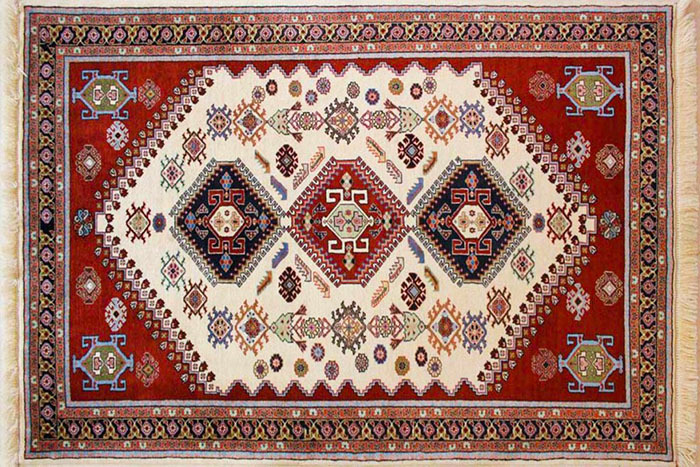 When asked by Mehr News Agency on what distinguishes Fars’ carpets from those of other provinces, a carpet expert pointed to their style and pattern without hesitation. “Fars’ weavers don’t follow a pre-designed pattern. They craft improvised knots and create novel art impromptu,” the expert went on to say. Therefore, their carpets are matchless; you cannot find two carpets that look exactly alike. People of Fars Province use authentic wool and colours in their carpets. Women in this province use a spinning wheel to make their authentic cotton and wool and even make dye out of plants. 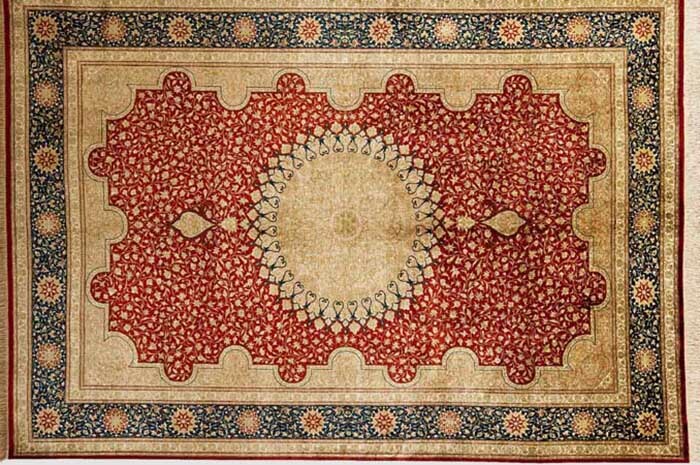 For that reason, no matter how long you use the carpet, it remains as beautiful and valuable as before. 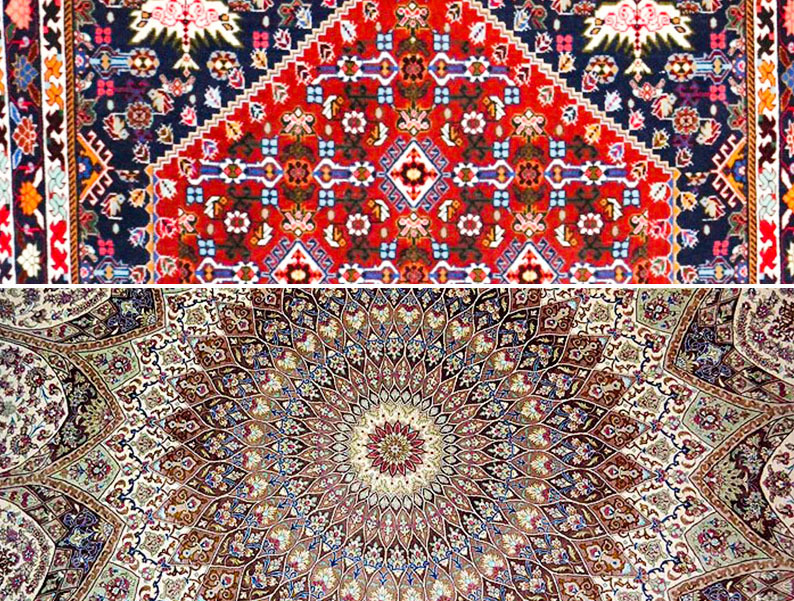 Iran’s holy city of Qom is also a pioneer in the field of carpet weaving; however, what distinguishes the carpets of this region from other cities is the diversity of colours. Such intricate yet enthralling combination of colours is not often seen in the carpets of other cities. Beguiling orange, purple, green and steel blue are the colours usually picked for the background. They are interlaced with intricate patterns and designs that grab the attention of every viewer. It is interesting to know that not a long time has passed since Qom’s carpets made way into the Iranian homes because they used to be exported for their high quality. However, the unfair sanctions imposed on Iran and the export of Persian carpets had ceased the export. Since weavers of Qom use pure silk in their carpets, their inimitable handicraft is known for richness of their details, high knot density and great lustre. Consumers are advised to walk on the carpet with care.